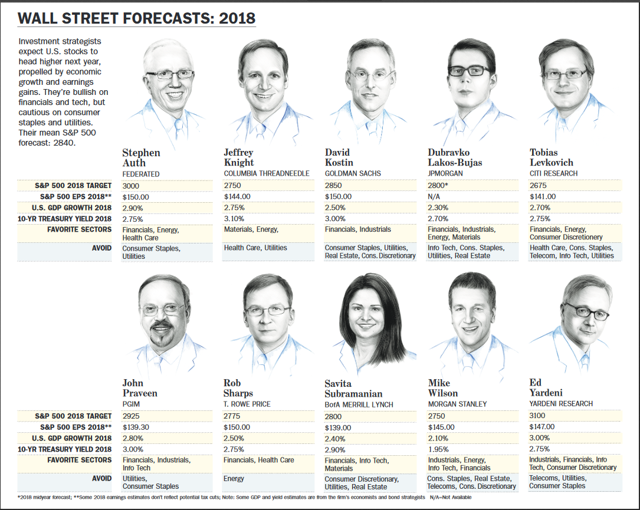 Weighing The Week Ahead: What Can Investors Learn From 2018 Forecasts? Can the rally in stocks find fresh legs in 2018? In the last edition of WTWA I observed that Santa might need a GPS to deliver on the typical year-end rally. The various sideshows – the Alabama election, the Fed meeting, the tax cut saga – played out and the market celebration continued. I always start my personal review of the week by looking at a great chart. Jill Mislinski’s weekly version is first-rate, pulling together several key points in a single look. She notes the new record for the market in addition to the daily moves. 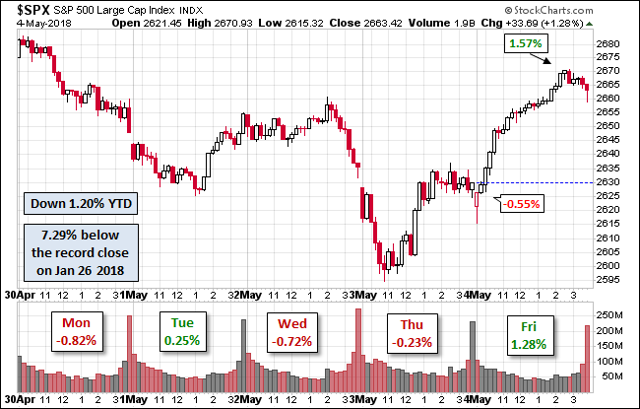 Friday’s rally was the key feature of the week. Her article also takes note of the big increase in volatility this week. Despite the excitement of the record high and Friday’s trading, the weekly trading range was again less than one percent. The economic news continues to be strong. New Deal Democrat notes a small deterioration in his long-range indicators. 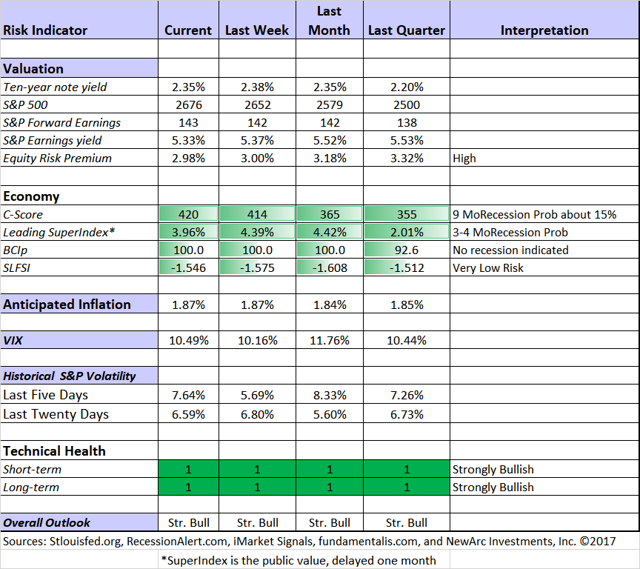 Take a look, as I do every week, at his helpful list of high-frequency indicators as well as his summary. For those of us with a serious interest in the economy, it is an efficient way to see items you would otherwise miss. Job openings told a positive story. The JOLTs report is widely misunderstood and most of the commentary is unhelpful. The most important elements are the quit rate and the labor market structure. Voluntary quits are at a rate of 3.2 million per month, better than before the recession. 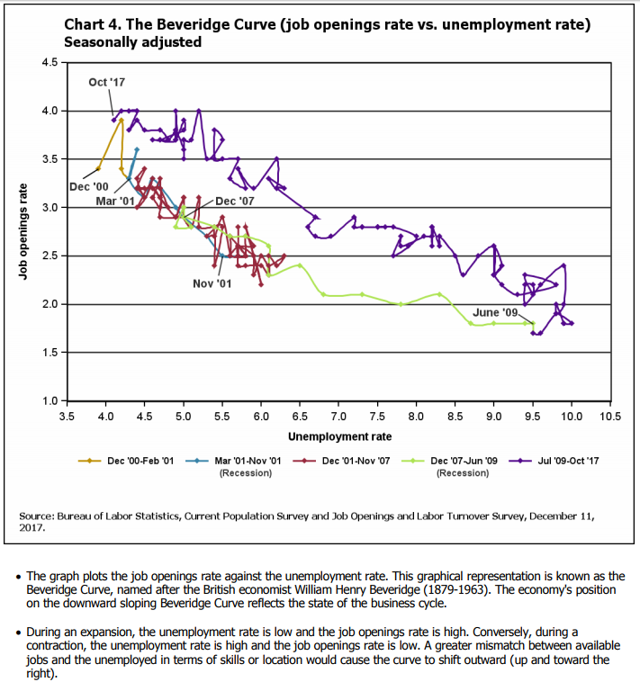 Structure of the labor market is best understood via the Beveridge Curve. Here is the BLS explanation. Inflation remained tame with both PPI and CPI core rates rising at or below expectations of 0.2%. 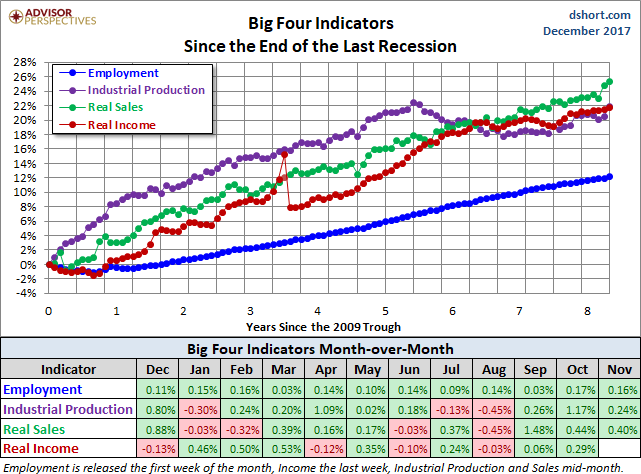 There are many that view this as a sign of a weak economy, but that is not consistent with the rest of the data. 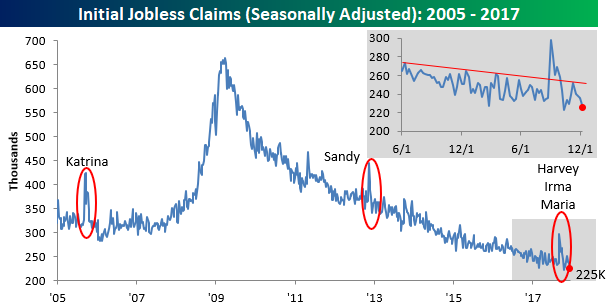 Initial jobless claims made another new low. Bespoke’s chart combines both a long- and short-term look. You might wonder how someone could view this as bad news, but see below for the answer. The FOMC decision to raise short-term interest rates was not a surprise, and the markets took it in stride. 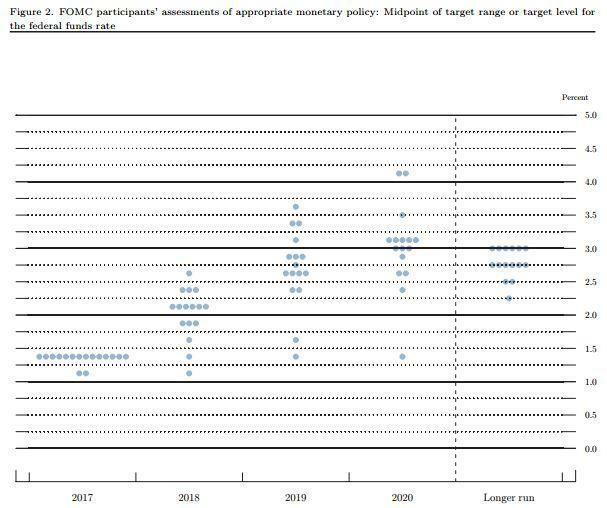 This is despite the continuing plan for three more hikes next year, as illustrated by the Fed “Dot Plot.” Perhaps the calm is because few market observers have much confidence in the dot plot forecasts! Tax cut legislation neared passage. With several key Senators either getting concessions or dropping their demands, Senate passage seems nearly certain. With the loss of a Senate seat and some serious illnesses, the GOP has a strong incentive to move quickly. (I know that many readers oppose these changes. Please note my description of “good” as “market-friendly.” It is one perspective, and the one most important to us in our investing roles. Industrial production was up 0.2%, slightly less than expectations, but the prior month was revised upward from a gain of 0.9% to 1.2%. This is a noisy series. New Deal Democrat takes note of this case of “hard data” confirming prior survey data. Sometimes the surveys serve as solid leading indicators. 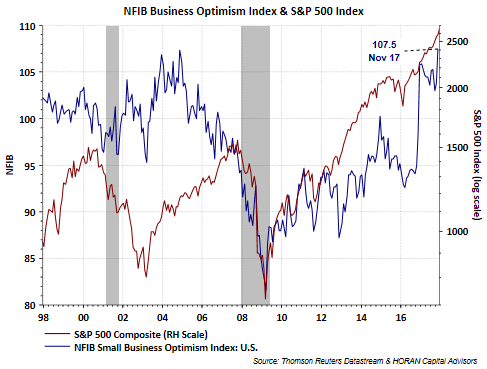 Small business optimism reached a 34-year high. (HORAN) If the survey opinions lead to action, small business investment and hiring could take an increased role as an economic driver. Retail sales grew at a very strong pace, 0.8% versus expectations of 0.3%. The prior month was also revised higher, from 0.2% to 0.5%. This is very encouraging for a sector regarded as under pressure. Not much bad news last week. Feel free to add comments about anything I missed. 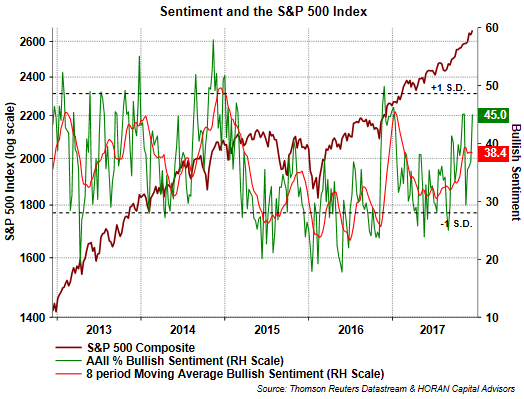 Investor sentiment turns more bullish, a contrarian indicator. David Templeton (HORAN Capital Advisors) notes this as a story mostly about the decline in bearish sentiment. Imports and exports, measured by sea container data, suggest an increasing trade deficit. 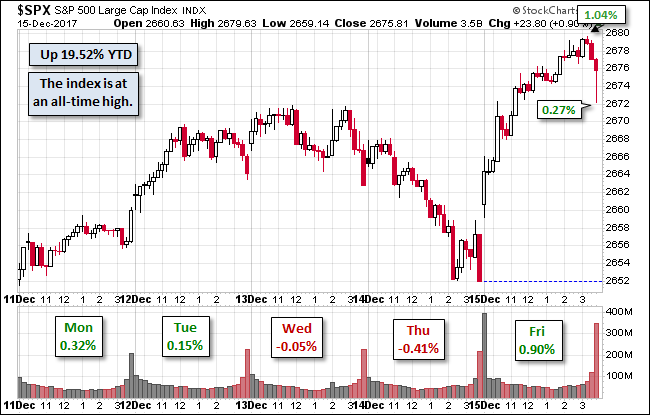 Steven Hansen’s excellent regular update on this story provides, data, charts and analysis. Student loans. Nearly 5 million students in default, double that of last year? Despite a strengthening economy? (WSJ). Student loans account for the largest asset of the U.S. government, $1.37 trillion. That includes only debt that is at the repayment stage. Mrs. OldProf (a former banker) sees this as a big problem. We need the contributions of graduates. Taking away their bank accounts and professional licenses does not help on that front. She notes that there are precedents for leniency as an incentive to take certain jobs or to work in certain locations. It is a very challenging issue. Wired has a great article on the increase in data collection and integration in China. Some will find it disturbing, but everyone should be interested. Imagine that you had a score, relevant for credit, and various other perks. It was influenced by whom you chose as friends. And so were their scores. Would it affect your choice of friends? Even George Orwell could not have imagined this! And how close are US methods? It is a big week for housing data. 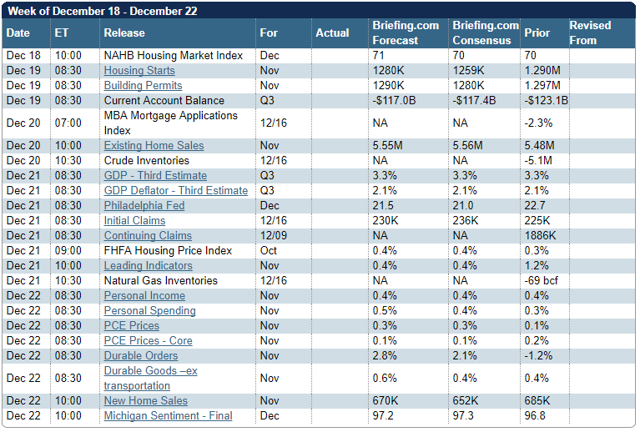 Starts, permits, existing sales, and new home sales are all released in the same week. Personal income and spending are also important. The PCE price index is the Fed’s preferred measure. And of course, with the FOMC decision behind us, FedSpeak can resume. The 2018 forecasting season is upon us! Bearish change. This requires a negative view on the economy and corporate earnings. An example is this source, which argues that a recession is in the “not-so-distant future”. The argument includes many of the recession analysis mistakes, including describing the poor forecasting record of the National Bureau of Economic Research. The author seems blissfully unaware of the actual role of the NBER. It is too bad that those claiming to be experts on this topic are not required even to know the definition of a recession! 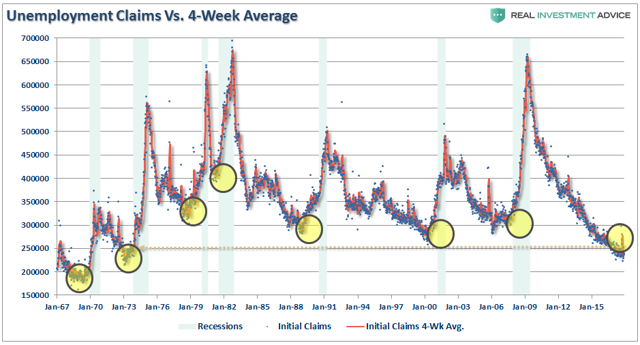 The author then takes a chart of current good news, jobless claims (see Bespoke chart above) and guesses that this might be the best things will get. I am always amazed that perma-bear authors get away with arguing that good news is bad (as is, of course, bad news). A recession always starts with a business cycle peak. Calling the peak is quite a challenge. You could draw the little yellow circles at several points over the last five years! Why now? Trending. This includes most of the Barron’s panel from last week. Here is the summary, but it is much more important to read the reasoning. Bullish change. Earnings expert Brian Gilmartin takes a skeptical look at the landscape and still finds that earnings are moving higher, and so are the changes in estimates. World economy. How about India? Specific sectors or themes. The IEA has an excellent publication on the World Energy Outlook. It includes a specific analysis of China and the sharp change in energy policy. For example, China’s energy mix is becoming more diversified, with greater emphasis on solar. Demand for the average household will double by 2040. Political forecasts – power shifts around the world. These are often speculative, but might be worth reading. Pseudo forecasts – research which seems to invite a conclusion, but leaves responsibility to the reader. This encompasses most of the objective stock research that supposedly does not do any forecasting. If someone writes, and supports with data, that on 27 of 36 similar situations stocks move higher, how should that be interpreted? “The Vanguard juggernaut will roll on until we see a very good correction of some length, if not a bear market,” predicts Dan Wiener of Adviser Investments, who, with his colleague Jeffrey DeMaso, has been thinking about big events that fund investors might face in 2018. What happens then “could be a complete reversal from the experience” of the past several years. As usual, I’ll have more in the Final Thought. Our discussion of trading ideas has moved to the weekly Stock Exchange post. The coverage is bigger and better than ever. We combine links to trading articles, topical themes, and ideas from our trading models. This week’s post discusses how to put your trading in the right perspective. Check it out to learn a great trading trick from Charles Kirk. Model performance updates are published, and of course, there are updated ratings lists for Felix and Oscar, this week featuring the DJIA. Blue Harbinger has taken the lead role on this post, using information from me and from the models. He is doing a great job. This week, the Federal Reserve decided once again to raise interest rates. True, interest rates are still quite low, but a lot of folks thought these hikes were a long way off (including me). Now they’ve really happened. The Fed also released its economic projections for the next few years. They see more rates coming next year (call me a cautious doubter on that). Remember, the environment for stocks will remain favorable as long as rates don’t get too high. We’re not there yet, so stocks are still good. Eddy’s much-awaited stock picks for 2018 will be released next week. Runner up is Roger Nusbaum, who looks at the dire predictions from several sources, including the usual suspects. He notes that Vanguard recommends tempering expectations, but not expecting a crash. He has some good charts and analysis. 24/7 Wall St is collecting the sell side ideas for 2018. Here are some samples. Oil service stocks. 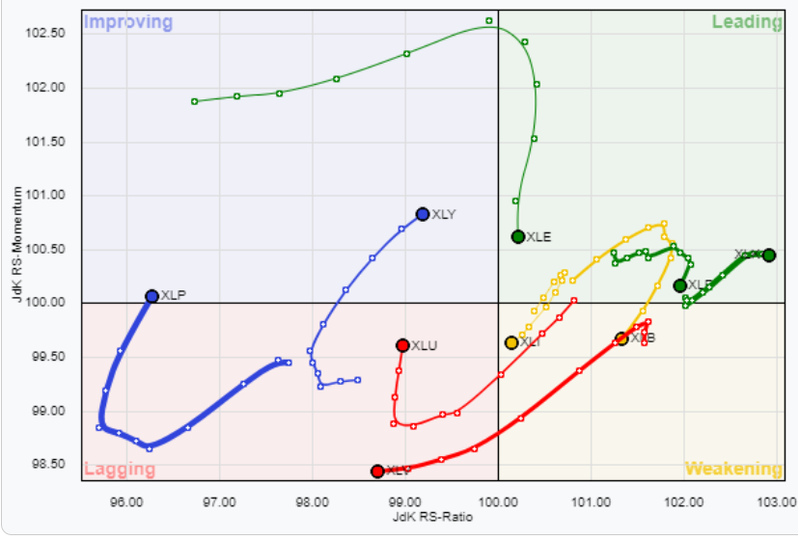 See also Ray Merola, who provides a close analysis about why he prefers Schlumberger (SLB) to Halliburton (HAL). Top DJIA stocks for 2018? Large-cap stocks expected to beat Apple (AAPL) and Amazon (AMZN). No real surprises, since they are other big stocks. The rationale is worth a read. And some ideas from our other favorite sources. Five dividend stocks for 2018 from Colorado Wealth Management. United Health Group (UNH) shows up as a choice on Peter F. Way’s unique method. Check out the post for his risk/reward chart. He also updates performance. Hale Stewart recommends a look at Black Hills Corporation (BKH). His argument is based mostly on technical analysis, and provides an interesting application of a rotation graph. (I’m not convinced, but my mind is open). Brad Thomas has some ideas for retail REITs – looking better after the recent news. Dividend Sensei suggests that Iron Mountain (IRM), a “hybrid storage/data REIT” can be bought on the dip from a secondary offering. The analysis shows the rare combination of a good business, a good yield, and attractive valuation. Blue Harbinger offers some “Amazon insurance” via five “attractive, high-income retail REITs.” He includes a nice performance comparison of FAANG stocks and the candidate REITs. He sees both big winners and losers, so read the entire post. Electric utilities appear fully valued after producing a 17% return in 2017, with an average dividend yield in the 3% range. Preferred stocks too seem richly priced, following a strong year in which their largest exchange-traded fund, iShares US Preferred Stock (PFF), has returned 8%. Next year, U.S. interest rates could finally show a notable uptick, with the economy possibly expanding at a 3% rate, unemployment staying around 4%, and global growth accelerating. If all that happens, yields on 10- and 30-year Treasury bonds could rise by a half-percentage point or more, resulting in negative total returns on Treasury notes and bonds. Hale Stewart recommends Cardinal Health (CAH) for dividend investors. He analyzes the financial data, the growing dividend, and the Amazon threat. While I do not disagree with the conclusion, it is an example of how you might do better (as we do in our enhanced yield program) by selling near-term calls while collecting the dividend. This strategy is especially good if expected downside is limited, while upside is gradual or limited. 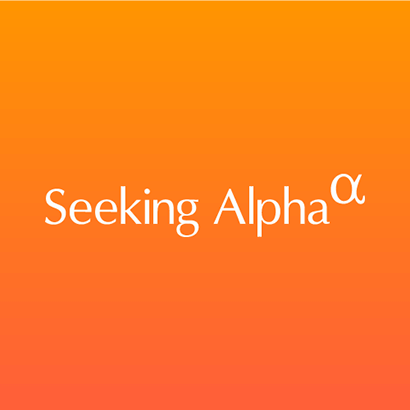 Seeking Alpha Senior Editor Gil Weinreich continues his strong work. Every day he has a topic of interest for financial advisors. 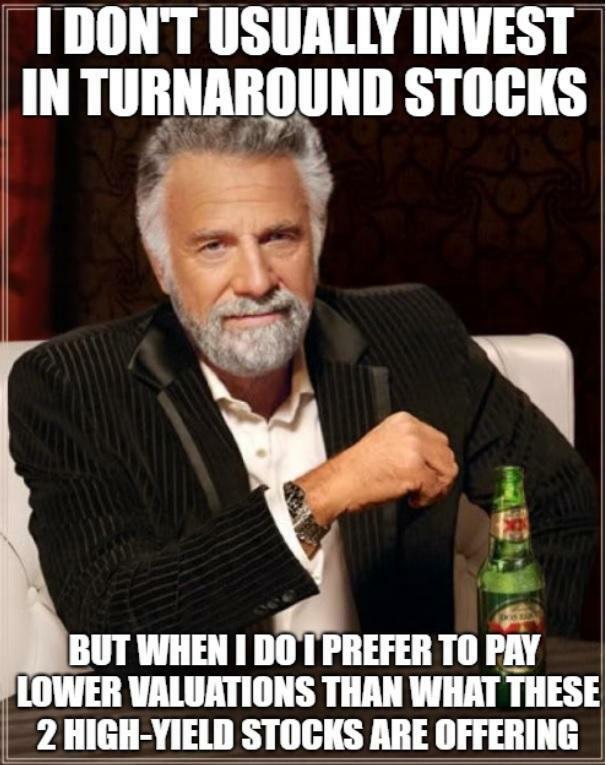 It usually hits key points for individual investors as well. This week he has a good discussion of how those who have “missed” the Bitcoin surge should feel about their approach. This is very important, especially as we enter the holiday season. Expect to encounter many who are chortling about profits. 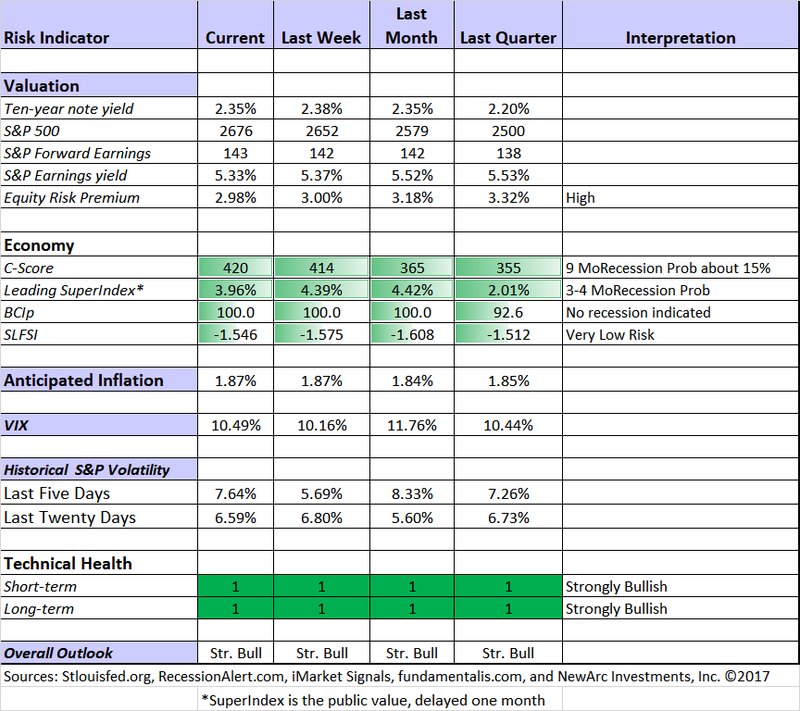 As promised, I have revised his excellent discussion last week of the values and pitfalls of market forecasts. Sucker Yields. Colorado Wealth Management helps to identify what might be too good to be true. A key is avoiding what is unsustainable given the company fundamentals. Costco. Brian Gilmartin takes his typical deep dive and comes away with some concerns. Forecasting season is valuable, if you approach it with the right attitude. Forecasts by others. Reading the ideas of others about what might happen helps to open your mind and avoid confirmation bias. I am dumbfounded by those who claim to believe in behavioral economics and yet close their minds to alternative ideas. I need not agree with the items on lists from Doug Kass or Byron Wein to find them useful. They often raise points missed by most other observers. You need not place great weight on specific market targets and forecasts. Look instead at the underlying reasoning. Your own forecasts. Many of my blogosphere colleagues explain that writing helps to focus their thinking and sharpen conclusions. Developing a forecast does the same. You need to think beyond the sloppy citation of a topic. What is the probability? What might be the consequences? Is there any advance preparation you can do? These need not, and usually cannot be precise. An estimate is much better than completely ignoring a topic. It takes work to do it right. Don’t be driven by the calendar. You should change your view of the world whenever there is significant new information. That is part of my reason for the WTWA series. My assessment of market risks, potential, and stock price targets changes constantly. Most people are not so disciplined, so the calendar is a reminder. Think of it like the admonition to change your smoke detector batteries when altering clocks for daylight saving time. Otherwise it is too easy to drift along in a daily routine, never looking at the big picture. Don’t give the illusion of precision. You do not know the chance of any particular event within 20 or 25 percent, at the very best. Don’t pretend otherwise. Don’t shift the burden to your audience. If you note that there is a Santa Claus rally 70% of the time, what does that imply for your actions, or those of your readers? If there is a 35% chance of recession in the next year, what are the implications for your portfolio. It is a cheap shot to throw a scary number out there and then ask your readers to figure it out. Those who have a sophisticated method adjust position size by their expected edge. If you take this approach, you have some idea about how to use data. Put some skin in the forecasting game. Make a small bet or two on a basketball pool or fantasy sports. You will learn a lot. The difference in sharpening your thinking and opinions will be as dramatic as that between paper trading and real money. Don’t reach too far ahead. You do not know what will happen in ten years, and neither does anyone else. If you are analyzing and adjusting asset allocations and holdings on a regular basis, a year or so is good enough. These changes can fit well in a long-term investment plan. Be willing to brainstorm and build simple models to help in assessing risks. I frequently did this in graduate seminars. The group, once moved beyond initial shyness, would always come up with great ideas. Each thought would stimulate something else. Think about some contingency plans. What would you do if the yield curve inverted? If NAFTA ended? If the Korean situation got much worse? I have a plan for each of these situations, and so should you or your advisor. In the case of Korea, for example, there are certain stocks and sectors that will be the first to feel a crisis. Buying puts in those stocks provides an immediate and leveraged hedge. You need not and should not wait until missiles are flying. 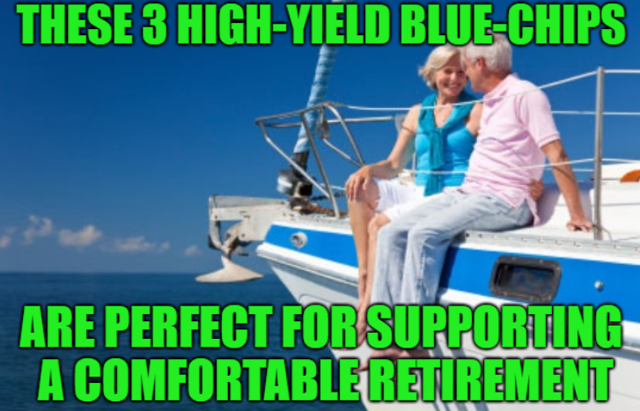 The current market climate includes many supportive elements. There is still time, perhaps a lot of time, to enjoy the opportunity. The optimal portfolio for good times is much different than what you would choose in riskier times. We should all be receptive to signals about risk! Tax bill effects on housing. The $10,000 limitation on state and local tax deductions will immediately reduce property values. Only the size of the change is in dispute. Low levels of credit default swaps. (Bespoke). This insurance is now back to levels from July,2007. This is good news unless the market assessment is unjustified. Long-term effects of the tax legislation. I am not offering an opinion on the impacts. The investor perspective should be on the next year or two. The initial effect should be positive; then we will see. Disclosure: I am/we are long CAH.